Spacious living and dining room area with excellent views of the Pacific Ocean. Sit at the kitchen bar and enjoy family while preparing meals. More than one cook can fit into this kitchen! 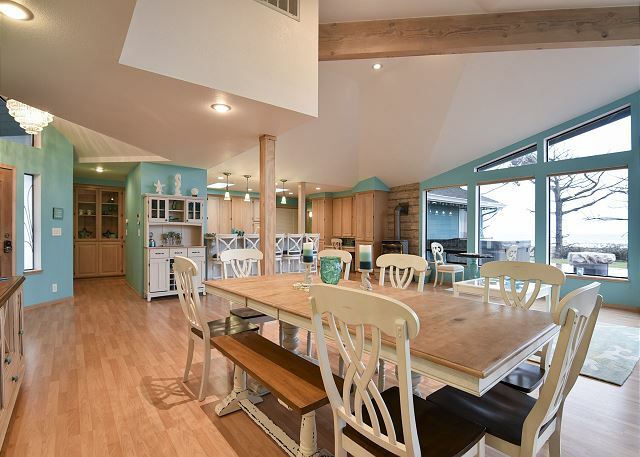 This home features a very large living and dining area for families to share! Fully stocked for all levels of cooking! Brand new appliances! Private steps to the banks of the Mad River. 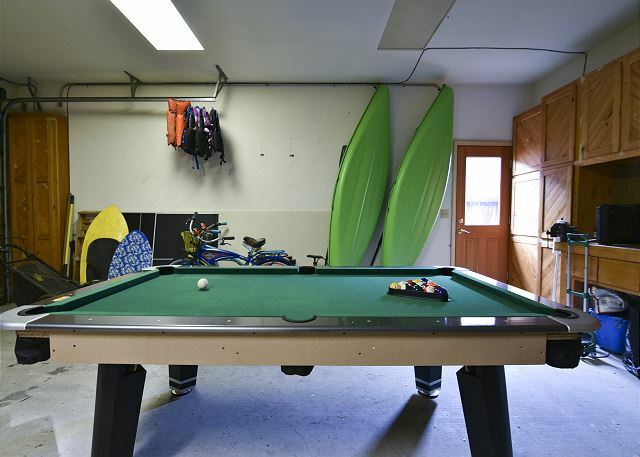 Garage holds pool table that converts to ping pong, kayaks for summer use on the river, and a couple bikes for explring the Hammond Trail! Friendly game of checkers anyone! BBQ on the deck for family fun! Master bedroom king bed. Brand new mattresses! 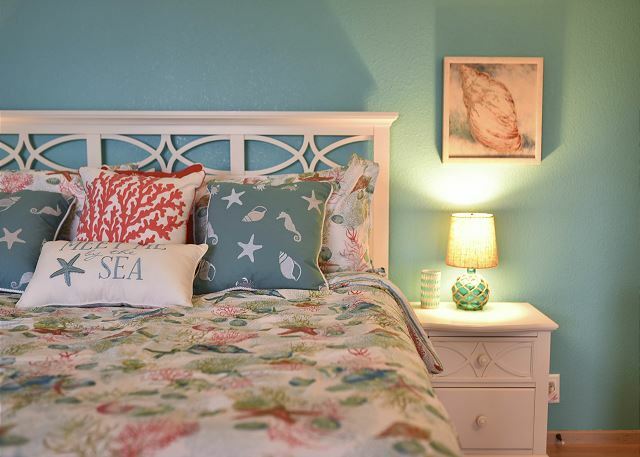 Sea and mermaid theme through out nthe home. 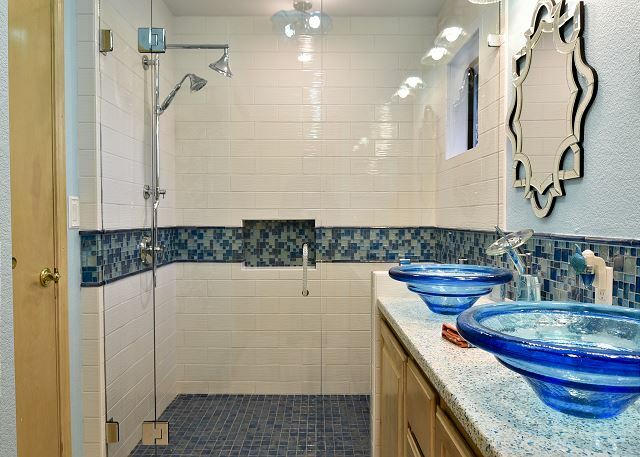 Glass round sinks and tiled showers in this home. Queen bed with memory foam pillows! Every room had a slider to the deck. Plenty of natural light thorughout the vacation home! Tastefully decorated by thoughtful owners. 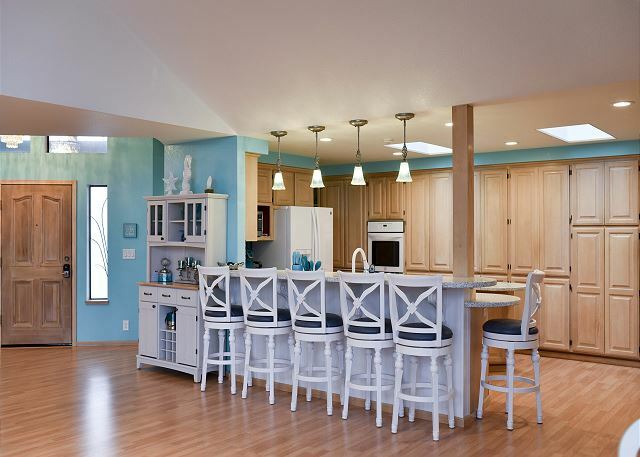 Tastefully remodeled home through out! Front door to the outside takes you to the Hammond Trail for walking and bike riding! Each bedroom is equipped with TV and electric firepalace! King bedroom soft and cozy. Trundle bed sleeps two in twins. Third bathroom with walk in shower. This home is just cozy and comfortable throughout! Nicely decorated in all rooms! 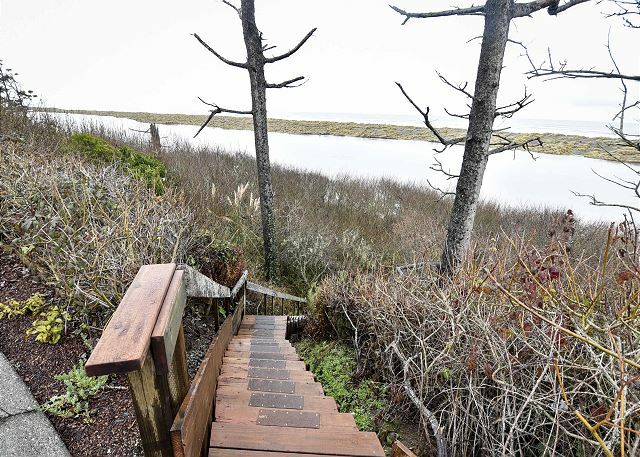 Mermaid Cove Beach Home is perched aside the Mad River and features amazing, unobstructed views of the Pacific Ocean. Gorgeously and appropriately decorated as a modern beach home, this accommodation is truly a getaway home. The tone is fresh, crisp, inviting, modern and very comfortable. 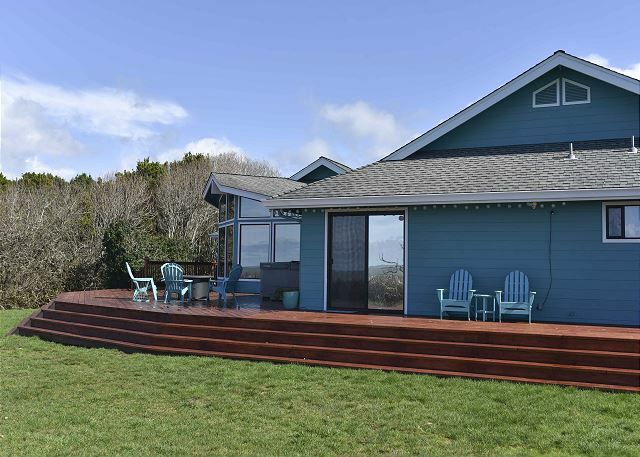 This amazing beach house is in a desirable neighborhood of McKinleyville. 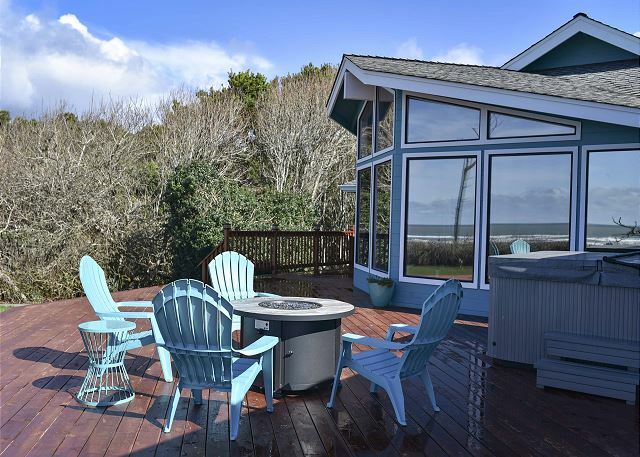 It offers all new modern amenities, panoramic views of the ocean, riverfront access, private deck with hot tub & gas firepit, spacious and inviting living spaces, all new furnishings, and much more. One bedroom is a king suite, a second bedroom has a king bed, and the third bedroom has a queen bed and a twin bed with a third twin for that room that is a trundle bed. The living room couch also opens up to a nice sofa bed. Enjoy the views of the ocean from your living room or bedroom. Dine in style at the grand dining table. Enjoy breakfast or evening drinks at the bar. 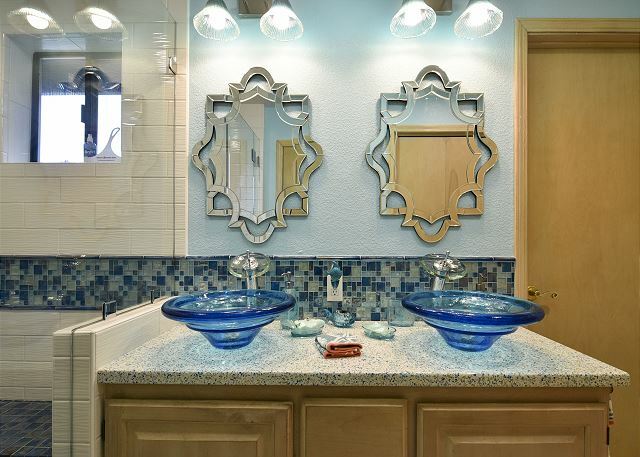 Pamper yourself in one of three amazingly tiled and decorated baths. Warm up next to the gas burning stove. Curl up and watch a movie in any bedroom or the living room. 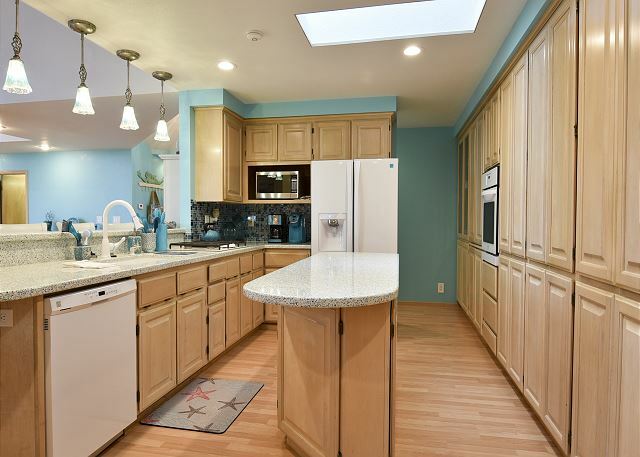 Cook a five-course meal for the whole family in a modern kitchen with all the amenities. Play a game of 9 ball on your private pool table or play some ping pong. Take the Kayaks to the river (at your own risk) and head to the dunes. Take a bike ride on the bikes proved down the Hammond Trail (at your own risk). 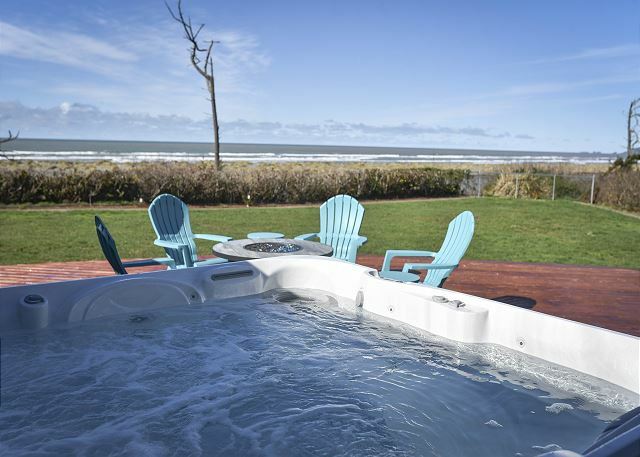 Enjoy the fire in your hot tub on your private deck and look over the pacific. 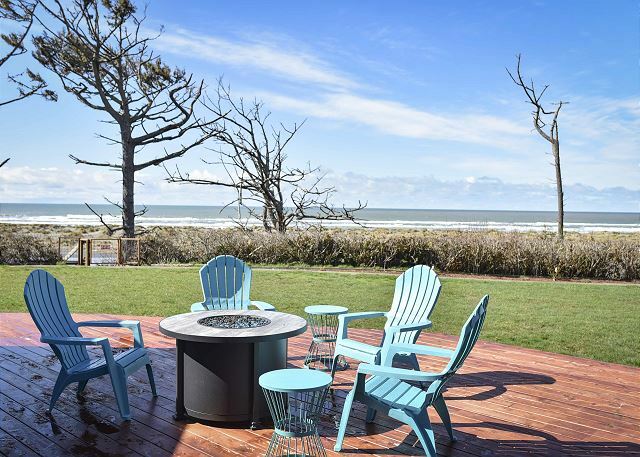 By now, you may have gathered… Mermaid Cove Beach Home is the perfect home to retire to during your Redwood Coast Adventure. 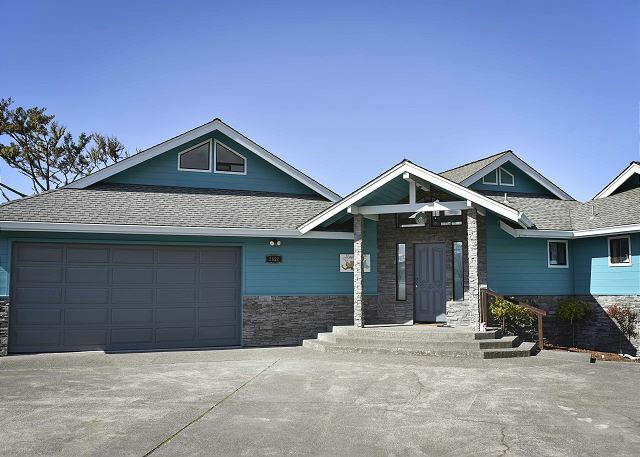 Located in a quiet and desirable neighborhood of Mckinleyville, CA just minutes from shopping, hiking, dining, movies and airport this place is perfect. 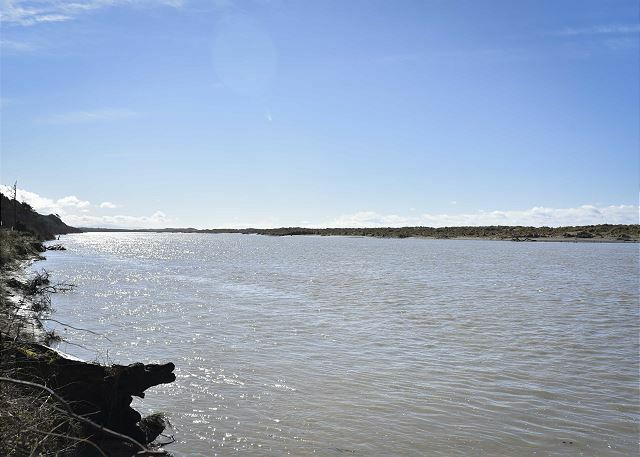 It is just 20 miles south of the of Redwood National Park, 50 miles north of Humboldt Redwood State Park, 10 minutes from Arcata and Beautiful Trinidad, the Hammond Trail is across from your front yard, and it’s just 15 minutes from old town Eureka. Stay, Relax, Recharge, and Come Back New! Brilliant, spacious, lovely spot. Seriously stocked for a very enjoyable stay! 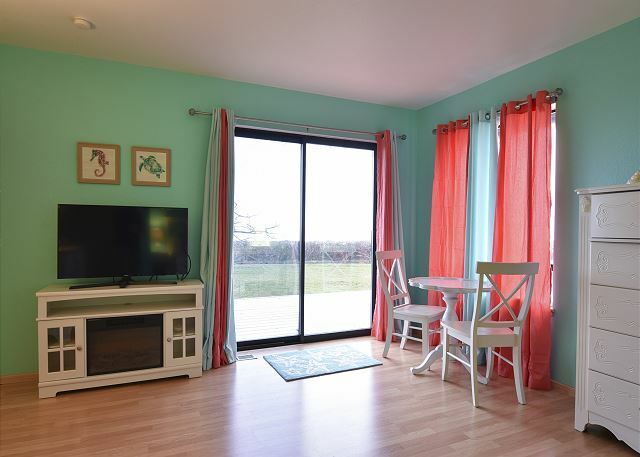 Thank you for choosing the Mermaid Cove and for booking with Redwood Coast Vacation Rentals. So glad to hear you had an enjoyable stay and I hope we will see you again. We had a great stay at Mermaid Cove. The house was clean, spacious and had everything we needed. We loved the view and enjoyed time in the hot tub. It was quite chilly while we were there and the house was warm and comfortable. There was a glitch with the bedroom TVs the first night of our stay but the owner and rental company promptly addressed the problem which seems like a permanent fix so unlikely to be an issue for anyone who follows us. Thank you for the nice review of the Mermaid Cove. We truly appreciate your patience and understanding, and allowing us to come in help out with the TVs. We are happy to hear that you had a great stay and we do hope we will see you again in the future. That is the best equipped rental I’ve ever stayed in. I would like to stay with my family there some day. Thanks for the great review Mike! We look forward to your return with your family, to the Mermaid Cove. PS Hope you had a good catch! The best home we've EVE R rented!! 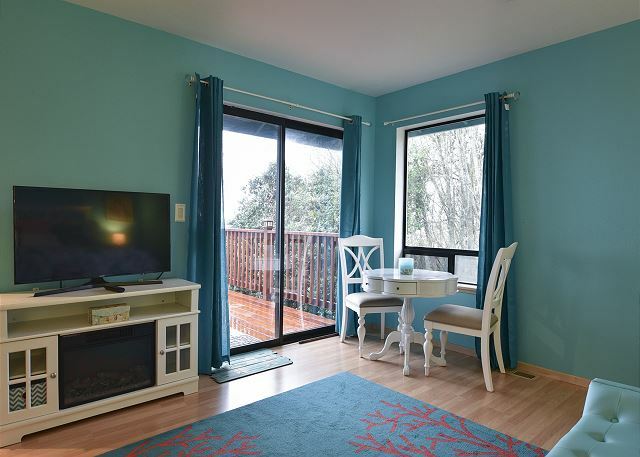 Thank you for choosing the Mermaid Cove and for booking with Redwood Coast Vacation Rentals. This home is such a delight! 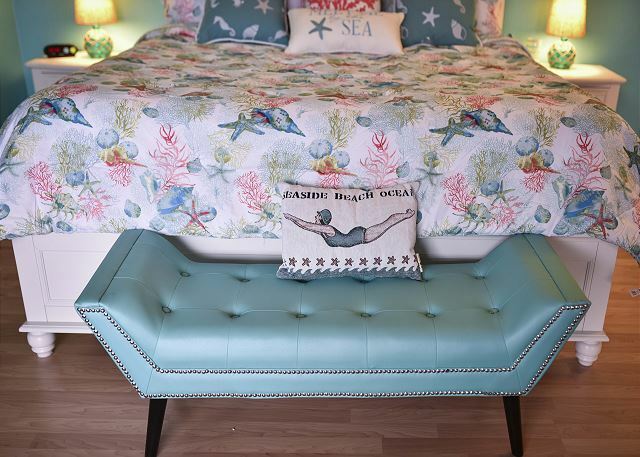 The homeowner takes much pride ensuring the home has everything a guest could use while on their vacation, down to a fun theme that is seen throughout the home. I will share with them that this was the best home you've ever rented...they will love hearing that! Everything is high quality. Great centralized location. Beautiful view. Outdoor activities at your doorstep. Thank you for your recent stay at the Mermaid Cove and for booking with Redwood Coast Vacation Rentals. Please look us up again if you return to the north coast for another visit. We would love to accommodate you again. Place was perfect for our needs. Lots of amenities that I have not encountered at other AirBnB sites. The pantry, although we didn't use it, was well stocked with basic food items, lots of towels and blankets as well as eating utensils, cups and plates. The coffee and tea packets were nice and much appreciated as well as the stroopwaffles. Location was close to the things we wanted to do. They kids wanted to stay longer. Instursction regarding our stay, things to do and check out procedure were easy to follow. Thanks for everything. The Mermaid Cove is a very special home, unlike any of our other homes. The themed charm and all the amenities...the homeowners really thought of it all. The owners take much pride in their home and really want all their guests to have everything they need, and it really shows. Thank you for your recent stay and for making us a part of your vacation and memories. We hope you will look us up again the next time you visit the north coast. We loved our stay! The beds are soooo comfortable and the kitchen is well stocked. The best part is watching the waves and the gorgeous sunsets. Great trail to walk each morning right next to the house! Fabulous Jacuzzi and outdoor fire pit made the deck superb! Loved it! Thank you for the great review of the Mermaid Cove! This is such a wonderful home. 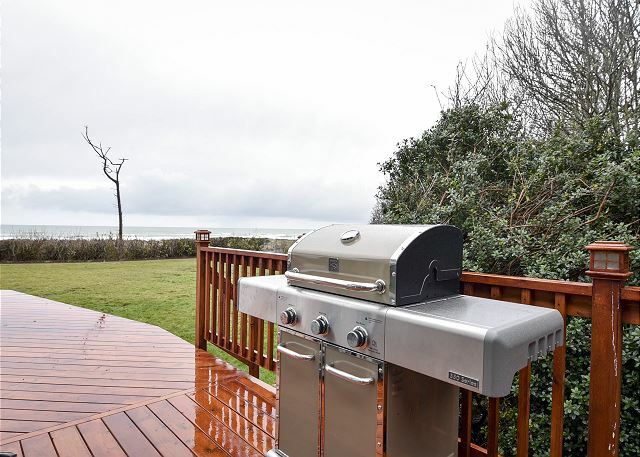 Stocked kitchen, great view, close proximity to the ocean, hot tub, and all the comfort one would want while on vacation. I am pleased to hear you loved your stay and I want to thank you for making us a part of your vacation and memories. Perfect the second time around!! Thank you for being a return guest to the Mermaid Cove and I am pleased to hear that it was still perfect the second time around! Loved the house, location and ease of booking. This was the perfect place for my family to meet, hangout and spend some meanful time together. If we come back to see the newlyweds, we will book it again!!! Great price for the location. Thank you so much. What a wonderful home to stay in, for such a joyous occasion. The Mermaid Cove is an amazing house. This is the ideal home for gatherings, as the layout is very open and accommodating for socializing, and the view cannot be missed. It sounds like the newlyweds live here, so I hope that means many more visits to come and take your time in the area. The house has kayaks, a pool table, and many other amenities that can be enjoyed while here, and you can get to know the north coast with your family that resides here. Thank you so much for choosing this home and for making us a part of your memories. We truly appreciate your staying with us. Property description accurate regarding location, layout and amenities - better equipped than most homes! ; pristinely maintained; great customer service via email and over the phone. Would love to return to this location at a future date. 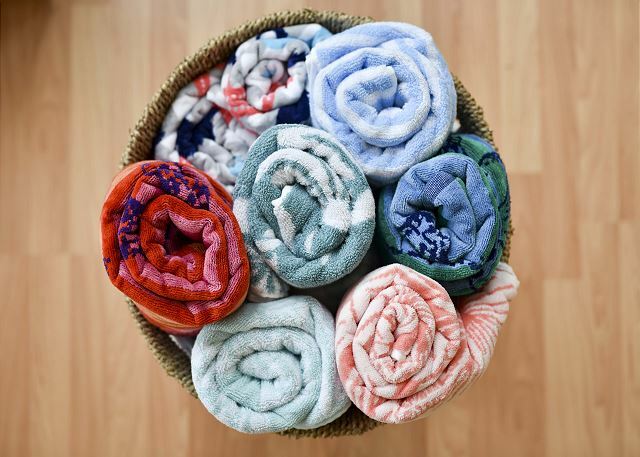 Many personal touches that make one feel like they are visiting friends rather than staying at a rental. Thank you for such a great review of the Mermaid Cove! I am so pleased to hear that this home met your expectations and that the home was appreciated so well. 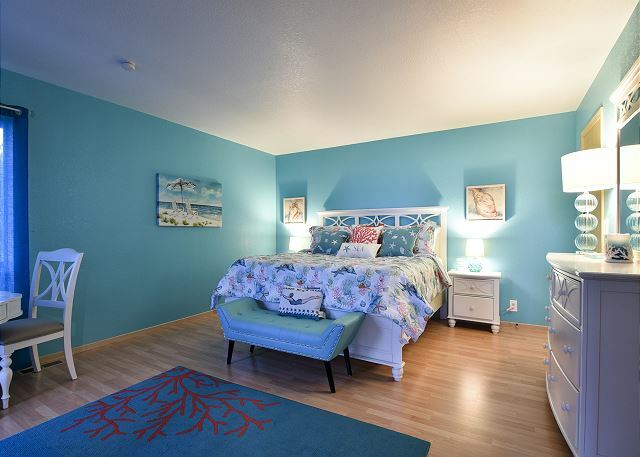 Thank you for booking with Redwood Coast Vacation Rentals and for making the Mermaid house a part of your vacation. Our stay was very peaceful, quiet and private. The house has wonderful ocean views (except when the fog rolled in!). Nicely decorated, lovely colors. The master bed was a little too soft for us; we should have tried the other main bedroom, and next time we will! Even though the house seems a bit isolated, it also feels safe and secure. Beautiful home. It was the perfect place to just relax and enjoy the view. Thank you for leaving a review and for choosing the Mermaid Cove. We hope you had a wonderful, relaxing time, and please visit us again here at Redwood Coast Vacation Rentals. Great stay at the Mermaid House! This rental was recommended as a great location and indeed it was! Close to the ocean and all of the nearby amenities, and still private and peaceful. Our family enjoyed our time here immensely! Mermaid cove is a great family spot . We hope you can enjoy and make more memories her again! Thank you for Mermaid Cove. It was just the place I envisioned for my family to gather as we celebrated my 95th birthday. They were in awe of the beauty of this area, several were first time visitors from the East Coast. It was a great central location as they explored in every direction. 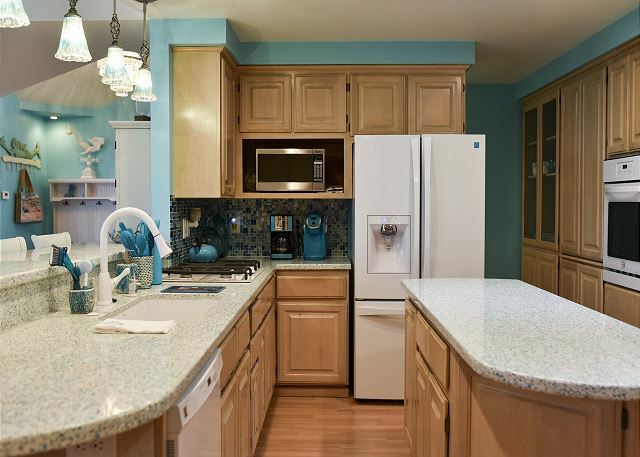 Mermaid Cove is beautifully decorated, well maintained, and very well stocked from kitchen equipment to kayaks. There were a couple of minor maintenance problems that were corrected as soon as reported. All members of the management team were very helpful from my initial inquiries in January until checkout. Everyone really enjoyed the stay and will recommend Mermaid Cove to anyone. Thanks, Francis! It was wonderful hosting you and your great family! Thank you for choosing Redwood Coast Vacation Rentals! Very well equipped. Pictures are perfect. Breath taking views. Well worth the "fun tickets". Located perfectly to enjoy Northern CA. Mermaid is a great spot for family vacation. Area parks and beaches are close proximity. Nice views of the ocean and the Mad River right out the front windows. Thank you for choosing Redwood Coast Vacation Rentals. This is a beautiful place to stay with a magnificent view. The accommodations are top notch and I would give it a 5 star rating. The property is impeccably clean. Thanks for the great review! We get many happy vacations here at Mermaid Cove with Redwood Coast Vacation Rentals. The Mermaid Cove house was one of the most beautiful properties I've ever stayed in. The house was fabulous, and the view was even better. There was so much attention to detail given to everything in the house. My group didn't have enough time to get to everything offered (like the kayaks! ), so we're going to try to make another trip up there very soon! Thanks for the great review! Mermaid cove is pretty spectacular. Our owners pay a lot of attention to the home. they want to make every guest special and look forward to reading comments in the guest book. Thank you for choosing Redwood Coast Vacation Rentals! Our mixed families of best friends and respective children had an amazing four night stay at the Mermaid Cove. It was relaxing, incredibly well decorated, and had all the amenities needed for a fun week. The property was beautiful and the interior was so much fun. Our three children loved the attention to detail, the bedding, the games and toys, and the fun lighting, sinks, etc. It felt like someone put a lot of love into the creation of the Mermaid Cove and it was obvious in the faces of our children. The general area is beautiful with tons to do and location is central to many wonderful outings. The property was clean, smelled great (many airfresheners) and the beds were very comfortable. If there was anything I would add, it would be more cookware (pots and pans) and a few more bikes (including a cart attachment for kiddos)....that would be a nice touch! I highly recommend this place and will probably go back again in the years to come. Great! We really enjoy every review we get at <Mermaid Cove. It makes the owners happy. They spend a lot of time in the home making sure it's perfect! Our guests are always the best part! Upon entering Mermaid Cove, we noticed the color scheme. 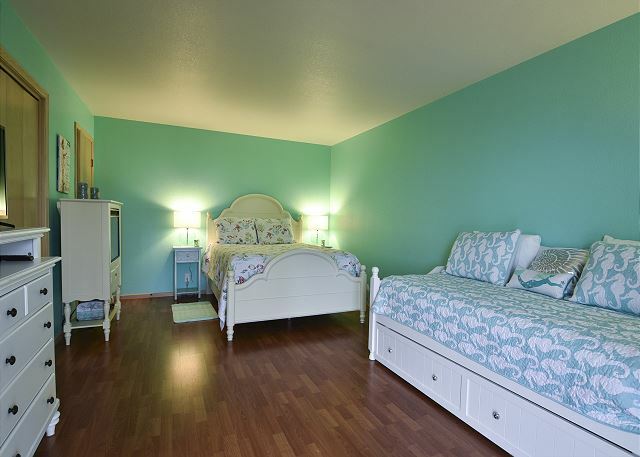 We kept probing more rooms and cabinets, and everything fit -- teal, mermaids, and other sea-themed items. Even the toaster was teal! That said, this was by far the best appointed rental house I've ever stayed in, and everyone in my group agreed. Dishes, glasses, cooking utensils, appliances, towels, etc. -- you name it, this house has it. Enjoy the hot tub after kayaking across the Mad River to the beach, or grab some growlers from Six Rivers and just sit on the deck and watch the sunset. Whatever your pleasure, this house can provide. Wow and great review! We hope to host again! Thank you for choosing Redwood Coast Vacation Rentals! Myu family and I always enjoy staying at the Mermaid Cove Beach House. It is beautiful, comfortable, warm, and welcoming. The furnishings, decorations, and amenities are wonderful and our most recent stay was all too short. We look forward to returning as soon as we can. Thanks again! See you next time and thank you for choosing Redwood Coast Vacation Rentals! Very nice house . we had a blast. Thank you for choosing Redwood Coast Vacation Rentals! Perfect! Hope we can have yous say with us again @ Redwood Coast Vacation Rentals! This is the second time I’ve used Redwood Coast Vacation Rentals. Samantha is a wonderful host/manager to work with. This home is beautiful, well appointed with more than enough of everything, from dishes to blankets to hot tub towels to space and the view!! Highly recommend this rental. Thanks, Kristie! It was wonderful to talk to you and meet some of you family! Hope to see you again soon! Very nice accommodations. The house was very clean when we arrived and well stocked with everything we could possibly need for our four day stay. However, there was only enough propane in the deck fire pit for about thirty minutes of fire. Overall, we would definitely stay there again and recommend it to others. We are pleased to have made memories with you and your family. We hope we can have you again next year! We have such awesome guests! Thank you for choosing Redwood Coast Vacation Rentals! Seven of us came together at the Mermaid Cove house for a Reunion: to catch up, enjoy old memories, and renew life-long friendships. The Mermaid Cove house was a very nice place to hold our Reunion. We hope this will be a permanent location for the reunion! See you nest year! The home was exactly as described to us. The house, the setting, and the views were amazing. Everything we needed was there. The staff were very helpful. WE have and will recommend your services. Even though the weather was cooler, there was still much to enjoy at the house and in the area. Thank you!! Thanks George! We love Mermaid Cove as much as you do and hope we can host again! What a spectacular vacation rental! It was everything we needed and more. The décor was beautiful and the amenties were great. Terrific view. Our only complaint was the fact that there were no sharp knives to use while cooking. Hated to leave. We enjoyed staying at Mermaid Cove. Lovely house, whimsical decor, beautiful flourishes throughout. 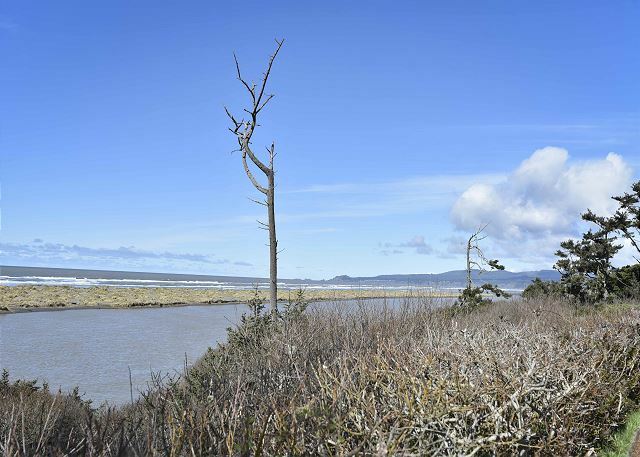 The property was exception, with both river and ocean views. Comfortable beds, modern conveniences, close to Hammond Trail, what more could you want? Thanks, Marge! Mermaid Cove is a great house for anyone to have a nice vacation! Hope you can come again with Redwood Coast Vacation Rentals! We offer 100+ vacation homes; a little something for everyone! Mermaid Cove is a gorgeous home with a gorgeous view. It definitely has its own character. Incredibly peaceful place to visit and relax for weekend. I would've never left the house for the weekend if I hadn't wanted to go see the redwoods so badly! Everything you need is there. Thanks for the fabulous review and hope we can host again with Redwood Coast Vacation Rentals! The solitude and beauty of teh No Cal coast is like no other place in my opinion. Mermaid Cove has all of teh comforts you need to make your stay truly a great one. Everything you need is here! The sunsets are gorgeous, the beds are great, plenty of games, supplies, and lots to do. Get on a kayak and go...rent this place. You wont be disappointed! Thanks for this fabulous review and hope we can host again here at the Mermaid with Redwood Coast Vacation Rentals! We absolutely loved Mermaid Cove!!! It was perfect for our large family and teenage children. The kitchen was completely stocked. This place exceeded our expectations. The hot tub and ocean views were amazing. The locatation was about 30 min drive to all of our favorite hiking and beaches. We would absolutely stay here again. Thank you so much for this great review and hope we can host again in the future at Mermaid Cove with Redwood Coast Vacation Rentals! We rented it for our son and our future in-laws from Georgia. They absolutely loved it! Thanks, Bob! So glad your family enjoyed the Pacific and Mermaid Cove! It's a great spot for all to enjoy! We absolutely loved this house. It was perfect in every way. The gorgeous view, the layout of the house, the well equipped kitchen, the many games and activities that can be done: biking, kayaking, volleyball, bocce ball, etc. This was a perfect vacation for our family including an 8 month old! Mermaid Cove is a favorite! We hope we can host again! We have 100+ vacation homes here at Redwood Coast Vacation Rentals. something for everyone to enjoy! Just what we needed. A beautiful home, well decorated and well stocked with dishes, towels, kitchen implements, blankets, etc. It had everything we needed. Thanks, Ben! We hope you will choose Mermaid Cove next time in the area! A beautiful home with a gorgeous view. 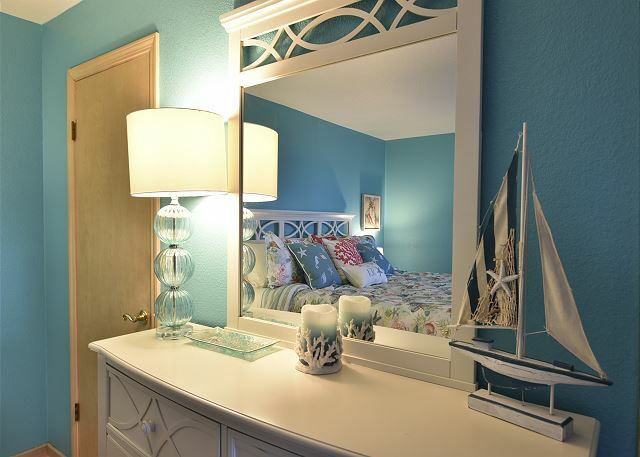 Mermaid Cove took great care to make every detail of the house match in a Mermaid/Sea Turquoise theme. They provided everything you could imagine, from kitchen gadgets to lawn games. We had the best time and would highly recommend Mermaid Cove. Excellent! Hope Mermaid Cove can be a place to look forward to every year! Had a wonderful time together in a beautiful home. The kitchen was well-stocked so cooking meals together was easy. The house is kept very clean and is nicely decorated. The owner/manager added many thoughtful touches throughout the home. It was an easy drive to the ocean beaches and Redwood National Park. There is a walking path accessible from the house. Seeing the sunset over the ocean from the back deck was amazing. Thanks for the great review and we hope you will let us host you and your family again in the near future with Redwood Coast Vacation Rentals! Rental was furnished with everything we could have ever needed, including kayaks and beach towels, shampoo and soap. Very clean, felt very comfortable there. Thank you for making such a memorable vacation! We hope we can see you again at the Mermaid cove! It's a lovely spot with all the amenities! The Mermaid Cove was the nicest rental we have ever used anywhere! Thanks! 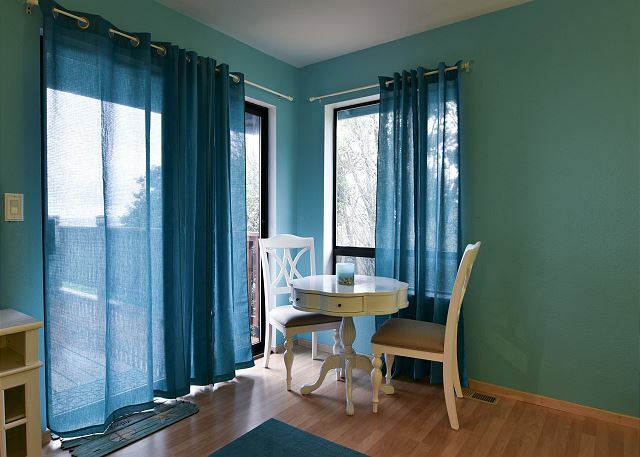 We are so happy we can create an enjoyable space for our guests here at Redwood Coast Vacation Rentals! Our owner take great care and pride in their home and it reflects in our guest reviews! Hope we can host again! One must experience this location to appreciate what a true find it is as a vacation home.The property was immaculately cleaned and ready on family was in McKinleyville for my son's wedding which was our main activity.All family member's(mine and the brides)who saw Mermaid Cove were extremely impressed with the property. Thanks, Frank! We are especially proud of Mermaid Cove and you noticed! We hpe we can host you and your family again with Redwood Coast Vacation Rentals! We have over 100 properties through out the North Coast! Something for everyone! We thoroughly enjoyed our week at Mermaid Cove. The views were stunning, the house was very well equipped and clean, and the attention to detail was unforgettable. Our group used the space as a meeting retreat and it served our needs perfectly. Excellent location right on the Hammond Trail. Thanks Maud! Mermaid Cove is a wonderful space for many occasions. We have over 100 vacation homes here on the North Cost. Something for everyone! Our gathering for graduation was over the top with Mermaid Cove to call home for a few days! Every room has an ocean view to wake up to along with a private bathroom.There was not a detail overlooked when furnishing this home for visitors! I will definitely book again when I travel to Arcata. Mermaid Cove is quite spectacular! Congratulations on your HSU graduate and hope you can book again with Redwood Coast Vacation Rentals in the future. We have over 100 vacation homes to choose from! What a beautiful property! Gorgeous home and view of Ocean is fabulous. This property is a must do! Thank you! We love our Mermaid Cove! Please, we really hope we can host again! The house was exactly as described on the website. Extremely clean and well equipped. Samantha was great to work with and went out of her way to provide information and assistance. Thanks, Mary! So glad you could get her to enjoy our fabulous Mermaid Cove! Hope to see you next year! The best vacation rental I've ever stayed in. Thank you for choosing Redwood Coast Vacation Rentals and hope you can come and stay with us again! Mermaid Cove was a fun get away for our family of 6. The house is stocked with everything we needed to have a comfortable and enjoyable stay for the 3 nights we were there. All of the decorative details were fun and the hot tub was amazing. Everything is new and in pristine condition. We would definitely stay again. Thanks, Nate! We would really love for you to come and visit us again at the Mermaid Cove with Redwood Coast Vacation Rentals! We have over 100 properties throughout the North Coast. We have a vacation home suitable for everyone! Beautiful home. Spacious. Amazing views. Best hot tub ever. The kids absolutely loved this place! Thanks for the great review and for choosing Redwood Coast Vacation Rentals! We hope you can say with us again at the Mermaid Cove! the house was fantastic both with location and how well it was stocked. It was exceptionally clean and comfortable. The only problem we had was the glass shower in the master bedroom did not drain so we were unable to enjoy it. Hi Ben! So sorry you had to experience a bad drain. This is a new house for us and our great owners showed us that there is a hidden hair trap in that shower and we will most certainly keep that cleared out for you and all future guests! We are pleased that the house was clean and comfortable for you and hope you will stay with us again in the future! Thanks, Nick! 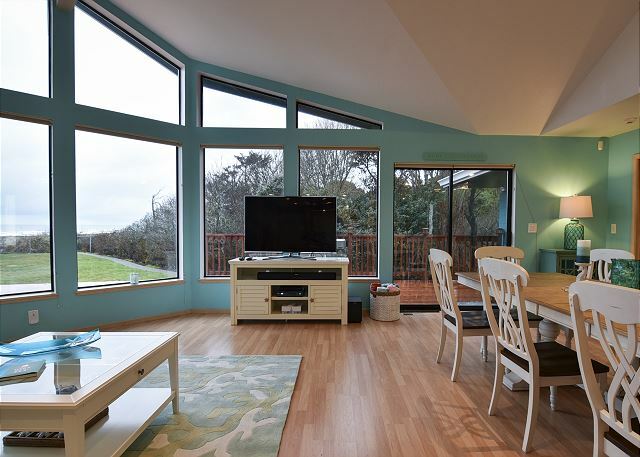 We hope we can host again at the Mermaid Cove with Redwood Coast Vacation Rentals! Very nice unit, too bad it rain the whole time but we have no control over the weather. Besides that everything was good,I must say there's a lot of blue around. Thanks Dean! I wish we could control the weather for everyone! So happy you had a nice stay otherwise! Hope we can host again with Redwood Coast Vacation Rentals!